Significant consolidation of design has taken place since the 1980s, although new types of electrical generators have also introduced further diversification. Vertical axis wind turbine (VAWT) designs were considered, with expected advantages of omni-directionality and having gears and generating equipment at the tower base. However, they are inherently less efficient (because of the variation in aerodynamic torque with the wide range in angle of attack over a rotation of the rotor). In addition, it was not found to be feasible to have the gearbox of large vertical axis turbines at ground level because of the weight and cost of the transmission shaft. The vertical axis design also involves a lot of structure per unit of capacity, including cross arms in the H-type design (Figure 3.2). The Darreius design (Figure 3.3) is more efficient structurally. The blade shape is a so-called 'troposkein curve' and is loaded only in tension, not in bending, by the forces caused as the rotor spins. However, it is evident that much of the blade surface is close to the axis. Blade sections close to the axis rotate more slowly and this results in reduced aerodynamic efficiency. The classic ‘egg-beater’ shaped Darrieus rotors also suffered from a number of serious technical problems, such as metal fatigue related failures of the curved rotor blades. These disadvantages have caused the vertical axis design route to disappear from the mainstream commercial market. FlowWind, previously the main commercial supplier of vertical axis turbines, stopped supplying such machines over a decade ago. Although there is not yet any substantial market penetration, there has recently been a remarkable resurgence of innovative VAWT designs in the category of small systems for diverse applications, especially on roof tops of buildings, and also some innovative designs have been made for large-scale offshore applications. Small-scale, multi-bladed turbines are still in use for water pumping. They are of relatively low aerodynamic efficiency but, with the large blade area, can provide a high starting torque (turning force). This enables the rotor to turn in very light winds and suits a water pumping duty. 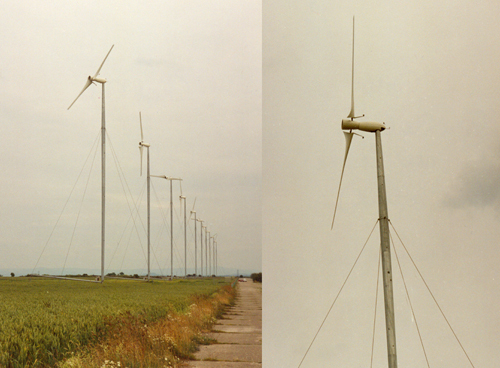 Most modern wind turbines have three blades, although in the 1980s and early 1990s some attempt was made to market one and two-bladed wind turbine designs. The single-bladed design (Figure 3.4) is the most structurally efficient for the rotor blade, as it has the greatest blade section dimensions with all the installed blade surface area in a single beam. It is normal to shut down (park) wind turbines in very high winds, in order to protect them from damage. This is because they would generally experience much higher blade and tower loads if they continued to operate. The one-bladed design allows unique parking strategies – with the single blade acting as wind vane upwind or downwind behind the tower – which may minimise storm loading impact. However, there are a number of disadvantages. With a counterweight to balance the rotor statically, there is reduced aerodynamic efficiency and complex dynamics requiring a blade hinge to relieve loads. The designs of Riva Calzoni, MAN, Messerschmidt and others were of too high a tip speed to be acceptable in the modern European market from an acoustic point of view. However, just when it seemed that the era of single bladed turbines had ended, the Spanish company, ADES, has announced the development of a single bladed, pendular wind turbine in which the cyclic torque variations of the single bladed turbine are compensated by allowing the generator to swing like a pendulum on the gearbox output. Moreover a new small scale single bladed design, the Thinair 102, rated 2 kW, is being marketed for home applications by the New Zealand company, Powerhouse Wind. The two-bladed rotor design (Figure 3.5) is technically on a par with the established three-bladed design. In order to obtain a potentially simpler and more efficient rotor structure with more options for rotor and nacelle erection, it is necessary either to accept higher cyclic loading or to introduce a teeter hinge, which is often complex. The teeter hinge allows the two blades of the rotor to move as a single beam through typically ±7° in an out-of-plane rotation. Allowing this small motion can much relieve loads in the wind turbine system, although some critical loads return when the teeter motion reaches its end limits. The two-bladed rotor is a little less efficient aerodynamically than a three-bladed rotor. In general, there are small benefits of rotors having increasing number of blades. This relates to minimising losses that take place at the blade tips. These losses are, in aggregate, less for a large number of narrow blade tips than for a few wide ones. In rotor design, an operating speed or operating speed range is normally selected first, taking into account issues such as acoustic noise emission. With the speed chosen, it then follows that there is an optimum total blade area for maximum rotor efficiency. The number of blades is, in principle, open but more blades imply more slender blades for the fixed (optimum) total blade area. This summarises the broad principles affecting blade numbers. Note also that it is a complete misconception to think that doubling the number of blades would double the power of a rotor. Rather, it would reduce power if the rotor was well designed in the first instance. It is hard to compare the two- and three-bladed designs on the basis of cost-benefit analysis. It is generally incorrect to suppose that, in two-bladed rotor design, the cost of one of three blades has been saved, as two blades of a two-bladed rotor do not equate with two blades of a three-bladed rotor. Two-bladed rotors generally run at much higher tip speed than three-bladed rotors, so most historical designs would have noise problems. There is, however, no fundamental reason for the higher tip speed and this should be discounted in an objective technical comparison of the design merits of two versus three blades. The one-bladed rotor is perhaps more problematic technically, whilst the two-bladed rotor is basically acceptable technically. The decisive factor in eliminating the one-blade rotor design from the commercial market, and in almost eliminating two-bladed design, has been visual impact. The apparently unsteady passage of the blade or blades through a cycle of rotation has often been found to be objectionable. This section discusses the two principal means of limiting rotor power in high operational wind speeds - stall regulation and pitch regulation. Stall regulated machines require speed regulation and a suitable torque speed characteristic intrinsic in the aerodynamic design of the rotor. As wind speed increases and the rotor speed is held constant, flow angles over the blade sections steepen. The blades become increasingly stalled and this limits power to acceptable levels, without any additional active control. In stall control, an essentially constant speed is achieved through the connection of the electric generator to the grid. In this respect, the grid behaves like a large flywheel, holding the speed of the turbine nearly constant irrespective of changes in wind speed. Stall control is a subtle process, both aerodynamically and electrically. In summary a stall-regulated wind turbine will run at approximately constant speed in high wind without producing excessive power and yet achieve this without any change to the rotor geometry. The main alternative to such a stall regulated operation is pitch regulation. This involves turning the wind turbine blades about their long axis (pitching the blades) to regulate the power extracted by the rotor. In contrast to stall regulation, pitch regulation requires changes of rotor geometry by pitching the blades. This involves an active control system, which senses blade position, measures output power and instructs appropriate changes of blade pitch. The objective of pitch regulation is similar to stall regulation, namely to regulate output power in high operational wind speeds. A further option, active stall regulation, uses full span pitching blades. However, they are pitched into stall in the opposite direction to the usual fine pitching where the aerofoil sections are rotated leading edge into wind direction. This concept, like the conventional fine pitch solution, uses the pitch system as a primary safety system, but also exploits stall regulation characteristics to have much reduced pitch activity for power limiting. 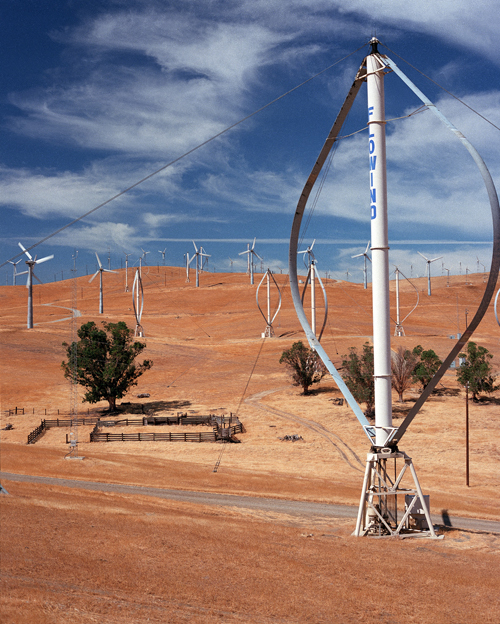 Initially, most wind turbines operated at fixed speed when producing power. In a start-up sequence the rotor may be parked (held stopped), and on release of the brakes would be accelerated by the wind until the required fixed speed was reached. At this point, a connection to the electricity grid would be made and then the grid (through the generator) would hold the speed constant. 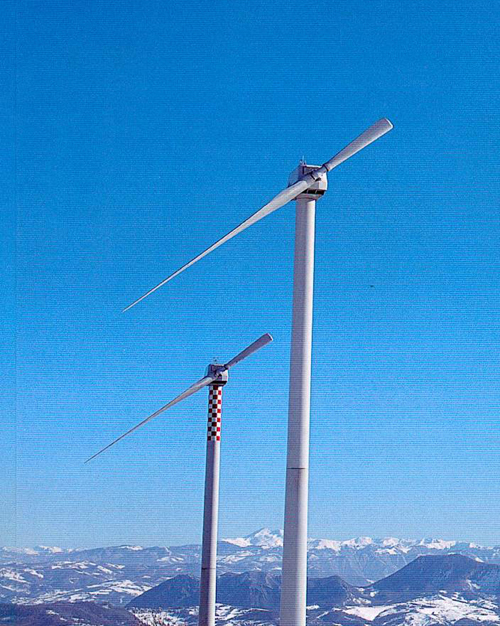 When the wind speed increased beyond the level at which rated power was generated, power would be regulated in either of the ways previously described, by stall or by pitching the blades. The design issues of pitch versus stall and degree of rotor speed variation are evidently connected. In the 1980s, the classic Danish, three-bladed, fixed speed, stall-regulated design was predominant. Aerodynamicists outside the wind industry (such as for helicopters and gas turbine) were shocked by the idea of using stall. Yet, because of the progressive way in which stall occurs over the wind turbine rotor, it proved to be a thoroughly viable way of operating a wind turbine. 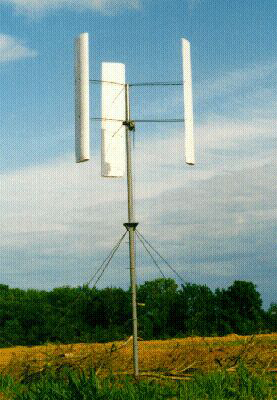 It is one of the unique aspects of wind technology. Active pitch control is the term used to describe the control system in which the blades pitch along their axis like a propeller blade. Superficially, this approach seemed to offer better control than stall regulation, but it emerged through experience that pitch control of a fixed speed wind turbine at operational wind speeds that are a lot higher than the rated wind speed (minimum steady wind speed at which the turbine can produce its rated output power) could be quite problematic. The reasons are complex, but in turbulent (constantly changing) wind conditions it is demanding to keep adjusting pitch to the most appropriate angle and under high loads, and excessive power variations can result whenever the control system is ‘caught out’ with the blades in the wrong position. In view of such difficulties, which were most acute in high operational wind speeds (of say 15-25 m/s), pitch control in conjunction with a rigidly fixed speed became regarded as a ‘challenging’ combination. Vestas initially solved this challenge by introducing OptiSlip (which allows a certain degree of variable speed using pitch control in power limiting operation, which allows about 10 speed variation using a high slip induction generator). Suzlon presently use a similar technology, Flexslip, with a maximum slip of 17 per cent. Speed variation helps to regulate power and reduces demand for rapid pitch action. Variable speed has some attractions, but also brings cost and reliability concerns. It was seen as a way of the future, with expected cost reduction and performance improvements in variable speed drive technology. To some extent this has been realised. However, there was never a clear case for variable speed on economic grounds, with small energy gains being offset by extra costs and also additional losses in the variable speed drive. The current drive towards variable speed in new large wind turbines relates to greater operational flexibility and concerns about power quality of traditional stall regulated wind turbines. Two-speed systems emerged during the 1980s and 1990s as a compromise, improving the energy capture and noise emission characteristics of stall regulated wind turbines. The stall-regulated design remains viable, but variable speed technology offers better output power quality to the grid and this is now driving the design route of the largest machines. Some experiments are underway with the combination of variable speed and stall regulation, although variable speed combines naturally with pitch regulation. For reasons related to the methods of power control, an electrical variable speed system allows pitch control to be effective and not overactive. Another significant impetus to the application of pitch control, and specifically pitch control with independent pitching of each blade, is the acceptance by certification authorities that this allows the rotor to be considered as having two independent braking systems acting on the low speed shaft. Hence, only a parking brake is required for the overall safety of the machine. Pitch control entered wind turbine technology primarily as a means of power regulation, which avoided stall when stall, from the experience of industries outside wind technology, was seen as problematic if not disastrous. However, in combination with variable speed and advanced control strategies, stall offers unique capabilities to limit loads and fatigue in the wind turbine system and is almost universally employed in new large wind turbine designs. The load-limiting capability of the pitch system improves the power to weight ratio of the wind turbine system and compensates effectively for the additional cost and reliability issues involved with pitch systems.